'A young woman travels along to a remote island to uncover a past she never knew was hers in this thrilling modern ghost story. When a mysterious letter lands in Hallie James' mailbox, her life is upended. Hallie was raised by her loving father, having been told her mother died in a fire decades earlier. But it turns out that her mother, Madlyn, was alive until very recently. Why would Hallie's father have taken her away from Madlyn? What really happened to her family thirty years ago? In search of answers, Hallie travels to the place where her mother lived, a remote island in the middle of the Great Lakes. The stiff islanders fix her first with icy stares and then unabashed amazement as they recognize why she looks so familiar, and Hallie quickly realizes her family's dark secrets are enmeshed in the history of this strange place. But not everyone greets her with such a chilly reception--a coffee-shop owner and the family's lawyer both warm to Hallie, and the possibility of romance blooms. And then there's the grant Victorian house bequeathed to her--maybe it's the eerie atmosphere or maybe it's the prim, elderly maid who used to work for her mother, but Hallie just can't shake the feeling that strange things are starting to happen. This book had chills creeping up and down my spine. It was eerie, mysterious and engaging all at the same time. The very thought of taking a shower and getting out and having a hand print on the outside of the shower glass is spooky. This book will have you gasping in fear, yet turning the next page because you simply cannot get enough. I simply loved this book. It had the right mix of mystery and creepy to keep yours truly totally captivated. This book was the only one that I hadn't read by this author and I adored her other books, so I pretty much knew that I would love this one as well. If you haven't read this author, you are missing out. Hallie James has just buried her father when she receives a strange letter in the mail telling her that the mother she thought had died when she was five, had in fact died a month earlier. Hallie questions everything about her childhood and her life as she knows it, when she receives this interesting bit of news. She thought her mother was dead and missed out on having a mother in her life as her father was the one who raised her. Knowing that her mother had been in fact alive all of these years, drives her to find out about her mysterious past and escape to a island in the Great Lakes. 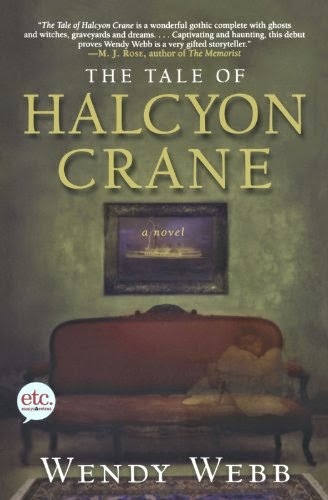 When she arrives she learns that there is so much more about her past then she could ever imagine and she sets out to learn exactly who was Halcyon Crane. This book was amazing in every single way. The ending was a little disappointing after the lead up to it, but it still was a fantastic read that made me realize why Ms. Webb is one of the best writers of our time. She has a way with the eerie that makes it scary, yet utterly intoxicating at the same time. I can't wait to read her next book as I have run out her books. This author cannot write as fast as I like it. If you want a fantastic eerie book to read late at night, this the book for it. I really liked this book when I read it, too. I think it's even better than her latest book, The Vanishing, which is good, just not quite as good as this one.